Weighing and batching equipment are integrated into bulk material handling systems to ensure that the appropriate quantity of material is utilized, packaged, or shipped. A weigh batching systems can be used to accurately fill containers like bags, drums, or bottles so that each container is filled with the exact same amount of material, or they can be used to ensure that an appropriate amount of materials is added into a batch being mixed. These systems provide accuracy and repeatability in bulk material handling systems. There are several types of weigh batching systems that are used in bulk material handling, and they use what are known as either gain-in-weight or loss-in-weight principles. With a gain-in-weight batching system, a volumetric feeder is used to feed the material into a weighing hopper. 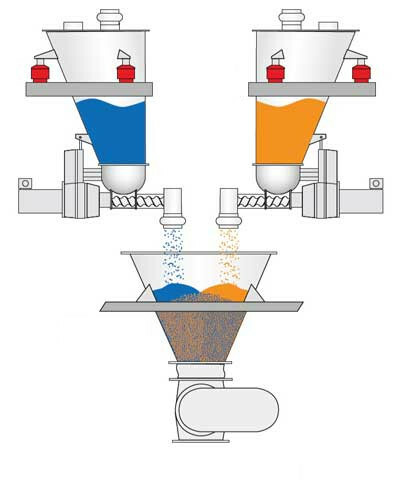 As material is added, the weighing hopper continuously takes weight measurements, and the feeders continue to release material until a set weight is reached within the hopper which triggers a mechanism that signals the feeders to stop. Many applications require that several different materials be added into the batch. In this case, each material is added to the weigh hopper one at a time. Once the set weight for an ingredient is reached that feeder is switched off and the next ingredient feeder is switched on until the next set weight is reached. This process continues until all ingredients have been added. This results in the hopper containing several layers, one for each ingredient since they were added individually. The sensitive automated controls in this weighing system prepare bulk materials for the next stage of the process by carefully controlling the release of substances. 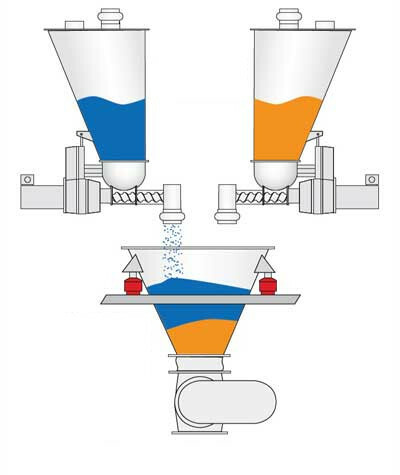 In a loss-in-weight batching system, multiple ingredients are fed into a collection hopper using highly controlled feeders. Each of the ingredient feeders is equipped with a weighing sensor, such as a load cell, to carefully measure the weight of the material within the feeder. As the feeders release material into a hopper, the system tracks how much of the ingredient is released by tracking how much weight was lost in the feeder. This is important in applications where smaller weights are at play and where more exact weight measurements are necessary. Additionally, batch mixing times are reduced down the line because these materials are introduced into the hopper all together instead of one by one, resulting in a blended mixture. Within these two types of weigh batching systems there is a wide variety of machinery. Machines vary in sizes and can be purchased to reflect the availability of floorspace in a commercial or industrial facility. Because industrial technology has advanced so much in recent years with the development of better digital control and sensors, bulk material weigh batching systems can be more precise than ever before. Full control and display units can be installed in a facility so that operators can monitor efficiency and output. Changes can now be made at the touch of a button, a feature which is especially convenient for suppliers who process high volumes of material for many industries on a daily basis.